It seems one trade show is hardly finished before the next one comes up! Last month we attended Integrated Systems - ISE 2016 in Amsterdam. Many thanks to everyone that visited us at the stand! If you missed us at the MANN Show in January or the ISE in February, why not drop by and visit us next month in Frankfurt at prolight + sound? Together with the Musikmesse, the companion music fair, this is the world’s largest and most important trade show for the event technology and musical instrument industry. 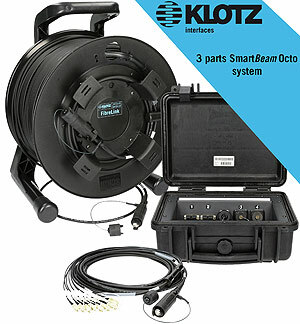 As well as meeting our team, you can be among the first to experience the world debut of our innovative new products – our SmartBeam Octo, an 8x expanded beam connector, and our very own Klotz XLR connector. We look forward to seeing you at our stand! See you in Frankfurt, where we’ll also have more interesting news for you! We’ve been on the road again! Last month we attended Integrated Systems - ISE 2016 in Amsterdam. Many thanks to everyone that visited us at the stand! ISE is Europe’s leading trade show for AV and electronic system integration. So it was no surprise that in this setting, our SmartBeam Octo – the world’s first 8x expanded beam connector – caused a sensation, as did our other no less innovative products featuring our own in-house XLR connectors. Prolight + Sound will open its doors in Frankfurt next month. This year the entire concept of the trade show has been redesigned – and our stand location has changed too. We look forward to seeing you in Hall 4. 1, Stand D08 from 5th - 8th April. This year will see plenty of excitement at the stand, with not one but two world debuts awaiting you: our SmartBeam Octo, an 8x expanded beam connector, and our very own KLOTZ XLR Connector will be at the show. These two products attracted enormous amounts of interest and attention at the NAMM Show and the ISE 2016, and we anticipate the same response in Frankfurt. But that’s not all by a long way. You’ll be amazed and impressed at our extensive range of cable and multicore solutions for professional event and stage operations and for ambitious musicians. Come and visit us – you’ll find it’s well worthwhile! We’re further upgrading our pro level series and will soon be doing the same for our other product lines right up to our high-end cables: these products will be made up using our own in-house developed XLR connector. Our GREYHOUND, M1, M2, AES/EBU and DMX cables will feature the new connector immediately. With practical ergonomic details and high-quality combination of materials, it’s the perfect complement to our cables. The quality of our cable range will be further enhanced by the new connector, yet our prices will continue to offer outstanding value for money. Cables for stage and touring life have to be reliable and durable as well as delivering top sound quality. The dual shielding and extra-low capacitance of the PROARTIST cable are the basis for superb signal transmission. PRO ARTIST delivers well-balanced sound and ease of use, and its special PVC jacket is as rugged as it’s flexible. The conductive plastic shield and copper spiral shield offer near to 100% coverage and protection for virtually interference-free signal transmission. Quality Neutrik jack connectors with metal housing and a shrink sleeve offering additional kink protection are smart and practical details that add the finishing touch to the PRO ARTIST. A network cable has four pairs of twisted wires, each with characteristic wave impedance of 100 ohms. Wouldn’t it be practical if the cable could be used to send four audio signals (analogue or AES/EBU), or even four DMX signals? Now this is possible – thanks to the new KLOTZ CATLink series. Why not choose an AES/EBU multicore for your fixed installation instead of analogue? An attractively priced AES/EBU multicore? For fixed installation? In top quality? No problem! Our new OX22AH bulk cable is available in versions from 2 to 24 pairs and is incredibly quick to make up, thanks to its tinned CU cores and paired foil shields bonded to the paired jackets with tinned drain wire. The cable naturally has a halogen-free (FRNC), flame-retardant jacket; its ultra-low attenuation maintains balanced signals even over long transmission distances, and its Al outer jacket with 100% coverage makes high-frequency interference a thing of the past. » Other new bulk cables in stock include. . .
Matthias Bauer joined the ProAVM & MI divisions as Technical Consultant at 1 March 2016. Hailing from the Upper Bavarian town of Markt Schwaben, Matthias Bauer was a sound technician at Tonwerk München GmbH and Bavaria Bild und Ton from 1996, before moving to WdW Productions GmbH in February 2000 as a sound engineer and later Supervising Sound Engineer. He remained with the company until 2014. Matthias Bauer recently qualified as an Electronic Equipment and Systems Engineer. At KLOTZ AIS, he will be at the interface between customers, sales and order processing and will support the National and International Sales Department. Matthias Bauer will also be responsible for internal coordination of customers’ technical consulting and project enquiries, and will process tenders and enquiries up to quotation issue.